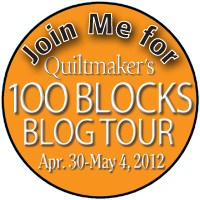 Get ready for Quiltmaker's 100 Blocks Volume 5 Tour next week. There are lots of fabulous prizes! 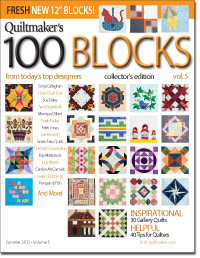 My block made the cover and I'm so excited. Can you guess which one it is? I'll be posting here on Thursday, May 3rd, to talk about my block and host my giveaway. In addition to the magazine, as a special bonus I'll be sending three of my patterns to the winner - their choice! Hope everyone has fun finding new, great designers and sites! The third one down, just to the right of the list of names looks like Veranda fabric, so I'm guessing that's yours! Beautiful. Congrats on making the cover!! Looking forward to the blog hop. Can't see well enough to guess which is yours, but congratulations! Congratulations! Will look forward to the big reveal! Huge congratulations Amanda. I'm guessing that yours is that 3rd down from the top in the larger grouping of all blocks on the cover. Congrats! I am excited; can't wait. I agree with the others that your block is 3rd one down to the right of the names. Congratulations! I think the 3rd block down with the dots going down the center is yours. Hi Amanda is is the 5 th row , 2nd to your left?